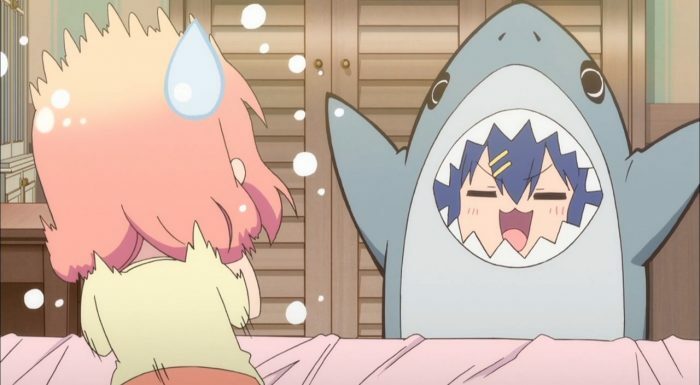 Umi da! It’s time for the infamous beach episode. 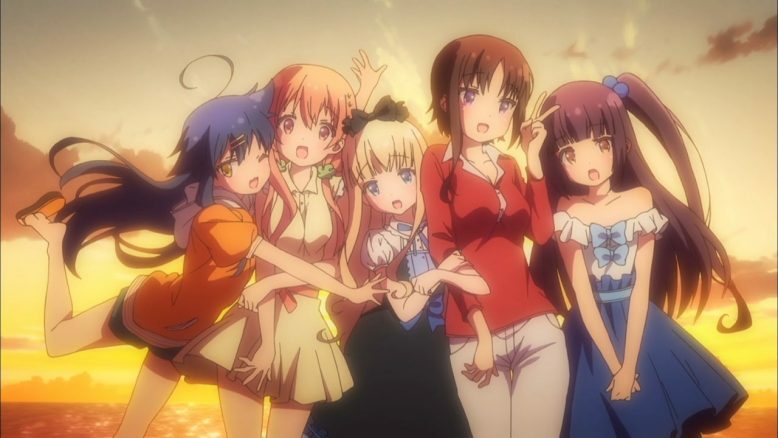 Most series that feature a cast of cute girls and which aren’t too serious will have at least one. 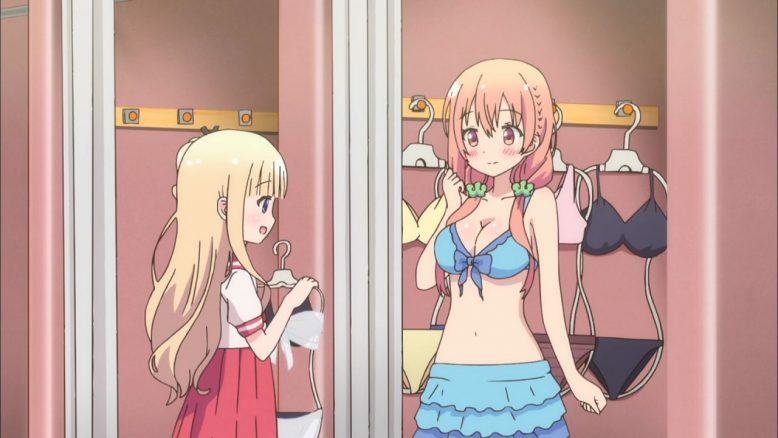 Hinako Note hasn’t been shy about its fanservice, so it’s not too surprising that we’d get an episode that is devoted to one of fanservice’s most traditional forms. Now, I have to admit that I can’t really relate to much of anything in this episode. Yes, summers are hot, but for me that means it’s the perfect time to find a nice air-conditioned room to stay in until the heat goes away. Going to a beach is a definite no. Beaches are hot, windy, wet, and full of sand. So. Much. Sand. Sand that gets everywhere, that infiltrates every pore of your body and every seam of your clothing and creeps into your shoes and your food and your drinks and your car and can never be gotten rid of no matter how much you clean. Once you go to the beach the sand will haunt you for the rest of your life. You can never be rid of it! 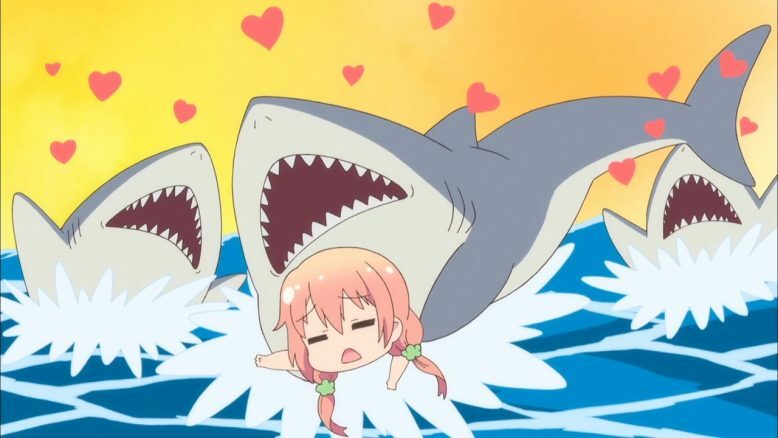 Also there are sharks. Those suckers can be anywhere. Stay out of the water. …Ahem. So, yeah, I don’t really share the girls’ excitement at the idea of a weekend trip to the beach. But hey, it’s fun for them, as is the idea of going to buy new swimsuits. 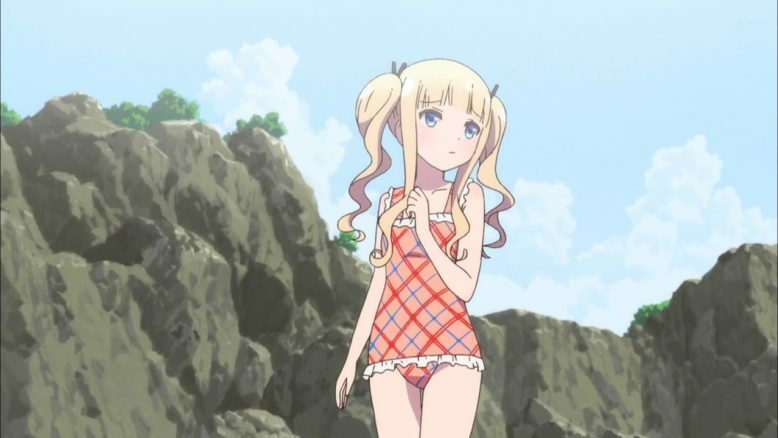 It is perhaps fortunate for everyone that they have their own fashion consultant in Mayuki to direct those less educated in the arcane lore of swimsuits to the proper choices. As it happens I think a lot of the fun for her is getting people to dress up in lots of different “costumes,” whether those costumes are cosplay outfits or swimsuits she seems to really enjoy dressing people up in interesting fashions. Still her choices aren’t bad, even if some of them along the way are perhaps a little outre, and the suits Hinako and Chiaki end up with suit them quite well. 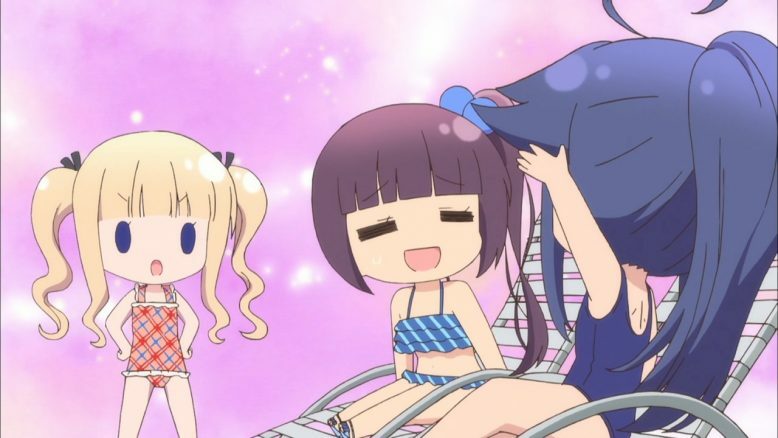 One of the major themes of this episode (besides “look at the cute girls in swimsuits!”) is Mayuki having difficulties because people keep treating her like a child. Now this I can relate to, because I’ve been where she is. For much of my time growing up I looked much younger and smaller than other children my age, to the point that people would often express outright disbelief when I told them how old I really was. It is really frustrating being treated as younger than you are. I can’t blame Mayu-chan for getting fed up with with it after a while. Of course this backfires on her when she stalks off down the beach without paying attention to where she’s going, and forgetting to bring her cell phone with her. Now, I know better than to say it’s impossible to get lost on a beach. Depending on many factors; including how crowded the beach is, how large the beach is (by which I don’t just mean the length, but the width: the distance from the water until the area where the sand stops and people no longer consider it to be “beach”), whether or not your group is set up by any distinct landmarks, and various other things; it can be entirely possible to have trouble finding one’s way back to one’s group if one isn’t careful. However, Mayu-chan failed at what should have been the very first step. When she realized that she’d walked too far and didn’t recognize where she was, the first thing she should have done was turn around and walk back the other way. One advantage a beach gives you is a distinct frame of reference: the ocean will always be on one side of you when you’re walking along the beach. Just turn around, keep the ocean at roughly the distance you remember it being before, and head back. While this may not get you perfectly back where you started, it’s better than continuing in what you know is the wrong direction. Meeting up with Ruriko there is fairly unexpected. 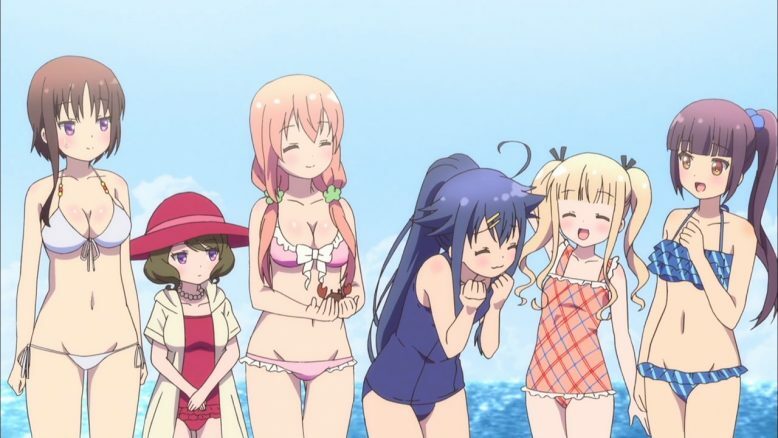 I guess the writers wanted to make sure they got all the girls in swimsuits, although at least Ruri’s is fairly conservative. Regardless, the comedy of errors as people try to contact people, go looking for people, get lost themselves, find each other, and eventually find their way back, is amusing but at the end of the day nothing really to write home about. Hinako still panics when confronted with people she doesn’t know, arguing again that her courage on the stage is a matter of her special mindset at the time rather than having overcome her social anxiety. Luckily Mayu-chan is able to “rescue” her, and after the animals lead them back to the others Hinako praises her to the others, giving her “reliable big sister” credit in the eyes of the first years. So all’s well that ends well. This is a simple episode with no real complexities to it, but in the end it’s still enjoyable. Fanservice is what it is, but these girls are fun people, and I find spending time with them and watching their day-to-say lives to be the most enjoyable thing about this series. I’m looking forward to more.